We’ve heard it a million times – how can I afford to eat like this? (“Like this” meaning Whole30 or a general Paleo diet.) We can’t argue the fact that it’s cheaper to eat a McDonald’s value meal than to craft your own healthy healthy dish by hand… but then again, diabetes medication is pretty expensive too. We’re not here to argue for all of the reasons you should eat better. If you’re reading our site, you already know that, and are trying to do something about it. 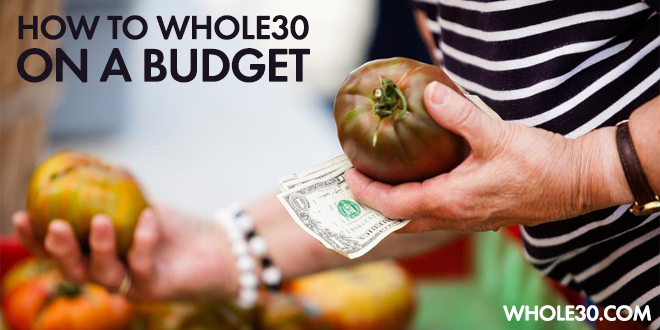 We’re also not going to get on one of our favorite soapboxes, called, “You just spent $5 on a latte, and that’s not even food.” Ultimately, it all comes down to making healthy eating a top financial priority, but there are plenty of ways you can make your current food budget work a little harder. For those of you who are on a budget (all of us), and trying to eat better (all of you reading), let’s talk about some really specific strategies for making your healthy eating dollar stretch just a bit further. No, we’re not just going to say, “Buy on sale, buy in bulk!” We’re about to walk you through our specific grocery store strategy – what we do, step by step, every time we hit the Whole Foods, Liberty Heights market or our local downtown Farmer’s Market. Because while we make food our top financial priority, right behind rent and electricity… we aren’t made of money either, and need to make our Paleo pennies work as hard as possible. One caveat, however. If you are truly committed to eating as healthy as possible, you may have to sacrifice some of your selfish food desires. You may want grapes in March, but at $8 a pound (and coming all the way from Chile), ytou likely just can’t afford them. The same goes for any of your food choices. We’re going to encourage you to buy for quality first and foremost, even if you have to compromise on taste and preference. Note, these are not a part of our official Whole30 program rules. There is nothing in the rules that says you have to eat pastured/organic/local/grass-fed. These are just our best recommendations for maximizing health and your budget while eating Paleo or doing a Whole30. Do the best you can with what you have. The first thing we do, and where the majority of your food budget should be spent, is on high quality animal protein sources. Head straight to the meat section (and check our still-evolving Conscientious Omnivore series for tips on buying high quality protein). Dollar for dollar, your health-money works hardest when you buy grass-fed or pastured and organic meat as often as possible. If there’s no grass-fed ground beef, but you’ve got grass-fed lamb available, buy it and find a recipe later. If there’s plenty of pastured chicken but no beef or pork, plan on eating chicken all week. If there’s nothing fresh in your local food market, ask for frozen; often, that’s where you’ll find the largest supply of high quality, locally farmed meat. And if you’ve got a few extra dollars this week, buy more and freeze it for later. Dollar for dollar, your health-money works hardest when you buy grass-fed, pastured, organic meat. If you simply can’t afford “best choice” meat, then follow this strategy. First, stick to meat from ruminants (beef, lamb, elk, bison/buffalo, goat or venison), as they tend to have access to their natural diets for at least a portion of their lives, and have a better healthy fat profile (and happier lives) than factory-farmed chicken or pork. Second, buy the leanest cuts available, and trim or drain all visible fat before eating. (Our main concern with lower quality meat comes from the unhealthy things—antibiotics, hormones, environmental toxins and pro-inflammatory omega-6 fatty acids—that “live” in the fat content. Omit most of the fat and you mitigate some of those concerns.) Third, consume chicken only without the skin and the leanest cuts of pork, for the same reason. And finally, avoid all factory-farmed processed meats, like bacon or sausage. Head to the fish counter next, but first, read our Conscientious Omnivore seafood post, and use our guide to help you make the best fish and shellfish choices. Some “best choices” are expensive (like wild-caught Pacific halibut, which usually runs upwards of $20 a pound). Skip it and find a less expensive but similar substitute, like cod or scallops. Fish won’t keep for more than a day at home, so don’t over-buy here, unless you plan to freeze it for later. And speaking of, frozen is often a good (and less expensive) option for fish and seafood. We buy flash-frozen sea scallops for $16 a pound, compared to $20 a pound fresh. Make one last stop at the dairy case for pastured, organic eggs. (See our Conscientious Omnivore: Eggs post for more guidelines.) They’re more expensive than their “cage free” counterparts, but where else can you get four meals’ worth of protein for just $5? Stock up and learn how to make a mean frittata, because these are one of the cheapest high quality protein sources available. Now that you’ve got your protein in order, your next priorities are vegetables and fruit, in that order. Shop with the understanding that we’d much rather you put your money into “clean” protein sources than organic fruits and vegetables. While pesticides aren’t delicious, eating high quality meat, fish, and eggs is far more important to your health. Pesticides aren’t tasty, but buying quality animal protein is more important to your health. Your most nutritious, least expensive option? A seasonal, clean, nutrient dense choice. Ultimately, however, we just want you to eat your veggies any way you can afford them. So if you’re strapped, don’t worry about organic or local, just buy as much of the dark, leafy stuff (think “nutrient density”) as you can afford and don’t waste money on the nutritionally-sparse veggies like celery, iceberg lettuce, and cucumbers. Frozen vegetables are also a good option, and tend to be cheaper. There are nutritional up sides and down sides to buying frozen, but in our view, the tiny amounts of nutrients lost (or gained) isn’t worth the worry—if frozen is easier or less expensive, go for it. You can also find some vegetables canned, things like pumpkin, butternut squash or sweet potato. These are a cheap and easy source of healthy carbohydrates; just make sure the only ingredient is the vegetable itself. As for fruit, if it’s summer, buy local, buy organic when you can, buy what’s on sale, and enjoy! If not, then it’s not in season and probably comes from a far-away place, which means it’s going to be expensive, not so fresh, and less than delicious. If it’s in your budget, use the Seasonal Produce Guide to help you make good fruit choices off-season, but remember, vegetables are always your top priority. You’ve all been told to “shop the perimeter” and stay away from the aisles, but the aisles are where you’re going to find a lot of your healthy fat sources, so dive on in and ignore all the brightly colored boxes. While adequate dietary fat is an important part of your healthy eating plan, fat can also be one of the more expensive items in the grocery stores, especially if you’re relying on the CrossFit dietary prescription of “nuts and seeds”. (In It Starts With Food, we explain why nuts and seeds aren’t your best option for health, never mind the price!) Here’s where you triage the rest of your money, and buy fat in the form you can afford with what’s left in your wallet. Luckily, some of your best sources are going to be the least expensive. Coconut milk (even the organic stuff) is under $2.00 a can, and provides a full 72 grams of fat; cheap, delicious and at the top of our go-to list for fats, so stock up and shake well. Next, check out the rest of the coconut products. Coconut butter is going to be wickedly expensive, but shredded coconut (sulfite-free) is more reasonably priced per serving, and totally portable. Don’t forget to check out the avocado in the produce section, they’re a year-round item, and not important to buy organic. (Looking to mix up your avocado? Skip the expensive pre-made guacamole make your own.) Finally, canned olives (black or green) in water and salt are cheap, portable, don’t need to be refrigerated, and a delicious source of fat. If it’s in your budget, check out the nuts and seeds last, letting health and price be your determining factors. (Refer to our Shopping List for guidance here.) You may want pecans, but if almonds are on sale, that’s what you buy. (See the theme, here?) Beware, as cheaper nuts will be roasted in low quality oil like soybean or peanut. =Those make you less healthy, so make sure you invest in raw or dry-roasted. And the actual nuts are probably cheaper per serving (and more satiating) than their nut butter counterparts, so put the $8 almond butter back on the shelf if you’re tight on cash. Finally, got some extra money left over? When you’re a little more flush (or find a good sale), stock up on things like cold-pressed extra-virgin olive oil (EVOO), organic, pastured butter, ghee, and unrefined coconut oil. These are all bigger ticket items, but will last you a few months and are all excellent fat sources. Bonus! Last but not least, consider slowly adding to your pantry staples (mustard, pickles, tomato sauce, etc. ), and your spice collection, with either fresh or dried (depending on the season). Seasonings can make chicken five nights a week taste exciting and different with each meal, and while they’re expensive, we’d spend an extra $5 not to be bored with our food. If you’ve shopped smart, you should have a cart full of things that maximize your health and minimize your expenses. We certainly don’t expect everyone to always buy organic this or grass-fed that, but do the best you can, keeping these guidelines in mind. Download our quick-reference Guide to the Grocery Store for a handy, portable summary of these tips.